SVG took some time with Forbidden CEO Ian McDonough to discuss the new releases at IBC, how its demo at the Microsoft booth echoes the work being done by deltatre for live sports, why he believes the M&E market is finally catching up to the cloud, and how he sees artificial intelligence playing into Blackbird’s future. What are the big announcements at IBC this year for Forbidden? We are launching two products here at the show. First is the Mac version of our Blackbird Edge software. This means that any Apple laptop now can [utilize] Blackbird, which opens up remote workflows, particularly. We already have four customers using that product and they’ve gone to remote locations like the Philippines and Cook Islands, and remote locations around the UK – all using very simple Apple hardware to upload into the cloud. Can you tell us a bit about the Blackbird cloud-based workflow you’re demonstrating here at the Microsoft Azure booth? We are showing our Microsoft Azure workflow. This is very handy for the [sports community] and members because it’s the workflow we do with deltatre, which they use for live and VOD content for [American football] and other sports. We have a team in Santa Monica that is editing those very long [football] games down to short highlights and a 40-minute package for [distribution] to European fans of the sport. Microsoft and deltatre are fantastic partners in that. We also work with the European Tour on this [platform] for golf, as well as other sports across the world. It’s a very solid, slick workflow and we’re excited to be demoing it here because we’ve gotten a lot of interest. Everyone wants to make more content, faster, and at a lower price – always while keeping the quality up. And those are exactly the needs that Blackbird can fulfill. 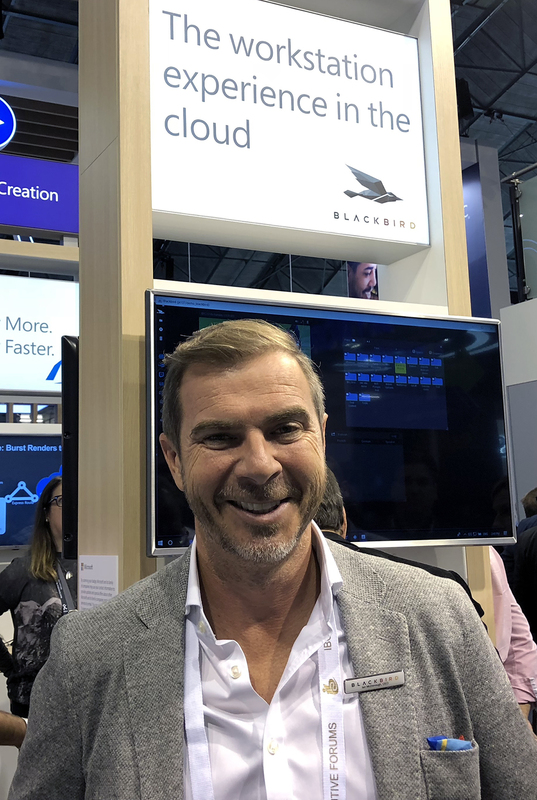 People are moving very much towards the cloud now to achieve that, which is very exciting because [Blackbird] is the only truly native cloud editor out there. Your company has been pushing cloud-based workflows from the beginning. So, as more and more M&E organizations now look to shift pieces of their production ecosystem to the cloud, do you believe the market is finally catching up to what Blackbird/Forbidden has been preaching all along? I’ve had very big broadcasters in the UK and U.S. telling me that they no longer want to be sending huge amounts of journalists and technical people to major sporting events around the world. It’s not cost effective and it’s not sustainable from an environmental perspective. They can now have smaller footprints of people going to these places and create most of the content remotely. So, it’s great to be where we are at in terms of cloud [capabilities] as the market is undergoing this change. Steven [Streater, Forbidden Technologies Founder and Director of R&D] and the technical team have done a great job of making sure that the software has moved with the times and is futureproofed. So we feel like we’re in a really good spot for this [transition to the] cloud. How are you seeing Blackbird’s role in the M&E market evolving as more organizations look to migrate towards the cloud? The conversations we’re having are with completely different scale than what they were six months ago, and six months ago they were at a different scale to the six before that, so it’s a very exciting time. I think our market is only limited by our imagination, so we have to make sure that we keep focused and we deliver our certain verticals. We have launched two new verticals in the last few weeks as well. We’ve launched a dailies vertical, which one of our new Hollywood customers Atlas Digital will be using. And we’ve launched localization as well. We’ve got our first customer already in localization, which is a very fast-growing business. You can now localize in our cloud live and that codec never leaves the cloud and never gets downloaded, so there’s no security risk – unlike if you’re selling DVDs or emailing files out. It looks like it’s a very promising area for us to develop further in. Earlier the year, you announced a technology alliance with Veritone for its aiWARE artificial-intelligence operating system. How do you see AI and machine-learning impacting the industry today and in the future? I think a lot of people are asking right now “are you AI yes or AI no?” I am definitely AI yes in the right use cases. We’ve seen some very simple use cases for the Veritone technology, such as compliance workflows where you’re pulling out images that shouldn’t be there, like logos. Also there’s logo [detection for] advertising to create an ad count. And then there is simple transcription and translation, which has gotten very good at this point – I think it’s really come a long way. I don’t think we’re there yet with automated clipping, though. We all know how quickly technology can move, but I think it’s still a bit too early. And I think those people who have [adopted auto-clipping technology] this early have probably regretted it. But I’m sure its time will come.